2. 1860 Census: in 1856, Joel went to Kansas to lend assistance to the free-state movement, so he does not appear in the 1860 census. 3. 1870 Census: Joel STROUB (æ 32, b. OH) is living with his widowed mother, Nancy (CUPP) STROUB, in Waldo, Marion Co., OH (p. 210B). No doubt because Joel's nickname is, "Joe," someone must have thought his given name was "Joseph." One of hundreds of inmates. 8. 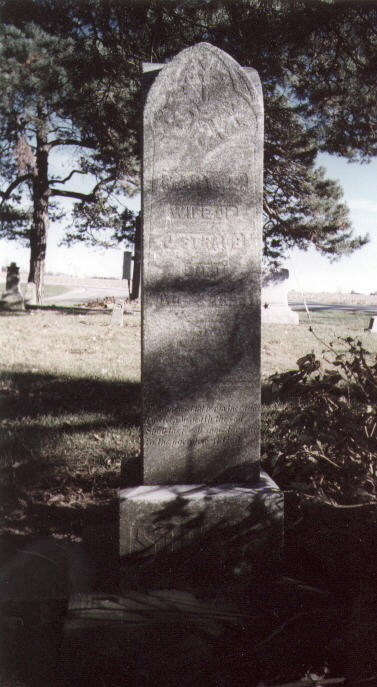 Tombstone Photo: Mary (NEWELL) STRAUB. Mea culpa, I have lost my source for this, but it almost had to be Mark or Carey HROSS — Mark and Carey, I have lost all our email in a computer melt down. Please contact me. 9. Obituary of Joel C. STRAUB (1837-1915). 11. Anon. 1883. History of Marion County, Ohio. Leggett, Conaway, & Co., Chicago (online at Heritage Pursuit). See excerpt for Joel STRAUB's participation in the Civil War. 12. Marion County Ohio Roll of Honor extracted from New Historical Atlas, Marion County, Ohio, Illustrated, 1878 (online at Heritage Pursuit). Sample of Ingratitude. This forenoon Joel Straub, who has a bad reputation for drunkeness and abusing his wife, ran up against the wrong fellow in a livery stable and got a severe jolt on the head with a single-tree. Straub afterward went to Dr. Maddox, who dressed the wound, but received no pay for the same. The Doctor, when he began attending Straub's injuries, pulled off his coat and laid it down, and Straub complacently picked it up and wore it home, without being observed. This was afterwards discovered, however, and Mr. Maddox went to the Straub domicile where he found the thief eating dinner with a better coat on than he usually wears. Straub became angry because compelled to give up the property and ordered the Doctor out of the house. This was too much for human nature, to get nothing for dressing a wound, to have the victim steal his coat, and finally be ordered out of the house for reclaiming his property, consequently a warrant was sworn out before Squire Richards this afternoon for Straub's arrest. A "single-tree" is the wooden crossbar of a wagon or carriage to which the traces of a harnessed horse are attached. 14. Family Group Sheets prepared by Carey Hross (5/99; 5/01). 15. Broderbund. World Family Trees. Volume 4, Pedigree #2705. 16. Archives of the STRAUB Mailing List (online at RootsWeb.com).